My Grandparents occasionally had cows. Black Angus to be precise and 7 of them in this instance. 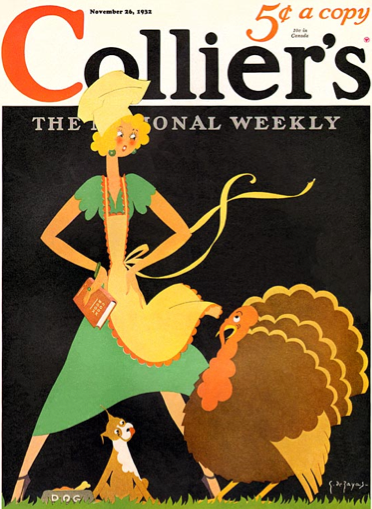 On a chilly November afternoon, a few (insert cough here) decades ago, my very pregnant mother was visiting my grandmother while both of their husbands were at work. Because the farm road they lived on was pretty secluded, a honk from a passing car always meant the same thing……The cows were out of the pasture and in the road. SO…… my 50 year-old grandmother (with the perpetually bad back), and my young mother (with 8 months of me in her belly), not really ran..but more, gaited, after the cows in the road in a futile attempt to convince the stubborn beasts back into the pasture. The 2 of them must have been a sad sight, because a second passing car stopped and a Good Samaritan started to help with the round-up without even asking if they needed any. It was the next night that my mother’s water broke, about a month early. A day and a half, and the threat of a possible C-section later, I arrived at 4:18 A.M. I hear a fresh version of this same story every November 18th. ……all I could think of was my pregnant mother on a country road in Ohio, chasing the cows. Were they the reason I arrived a little early? I found this picture in a shoe box the other day. It’s dated April 1969, about 5 months after my birth. I’m sure there are plenty of pictures before this one; I was the first born after all. 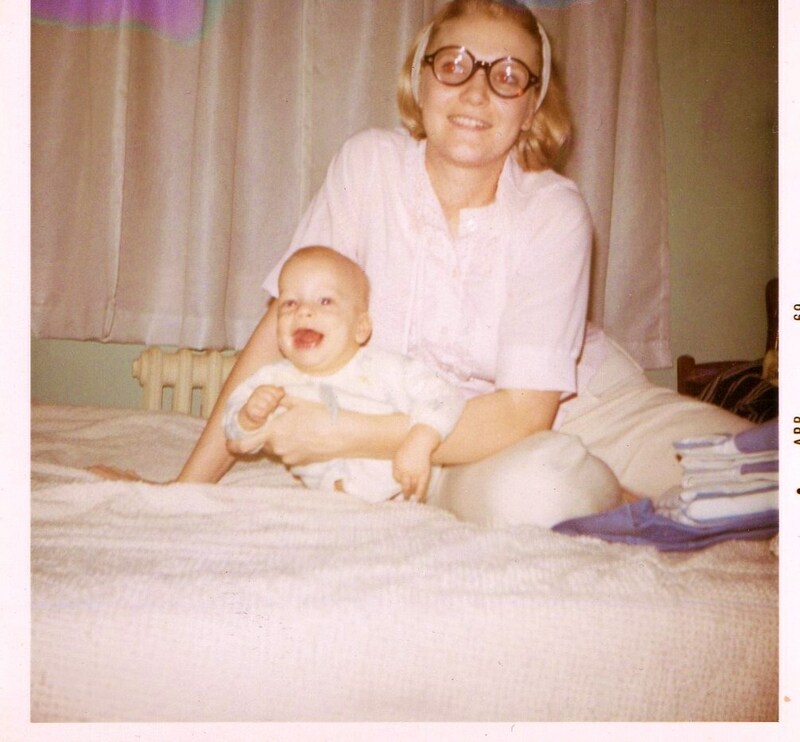 But something about my big, open mouth and my young mother’s “Edith Head” glass that I liked. Now to wire this puppy with lights. I know! It just gets better and better. I marked my hole locations with thumb tacks. I started with one on every tip, and one on every corner joint. Then I measured the distance between them to get an estimate of how many holes to drill. 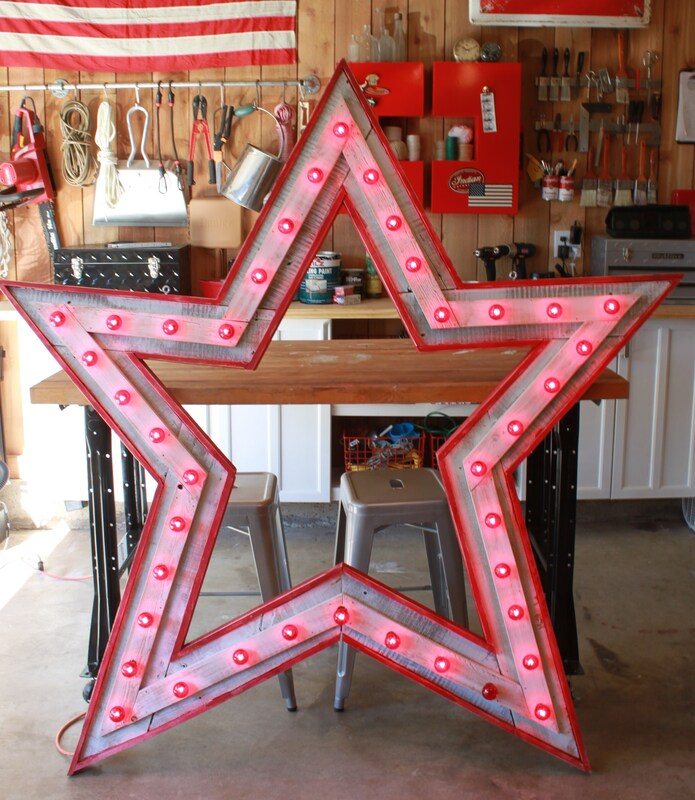 By putting holes about every 5 – 5 1/2 inches, every board will have 4 to 5 lights. 42 lights total, by my count. I used a 3/4 inch wood paddle bit to make all my holes. My C-7 light sockets are just about this size. 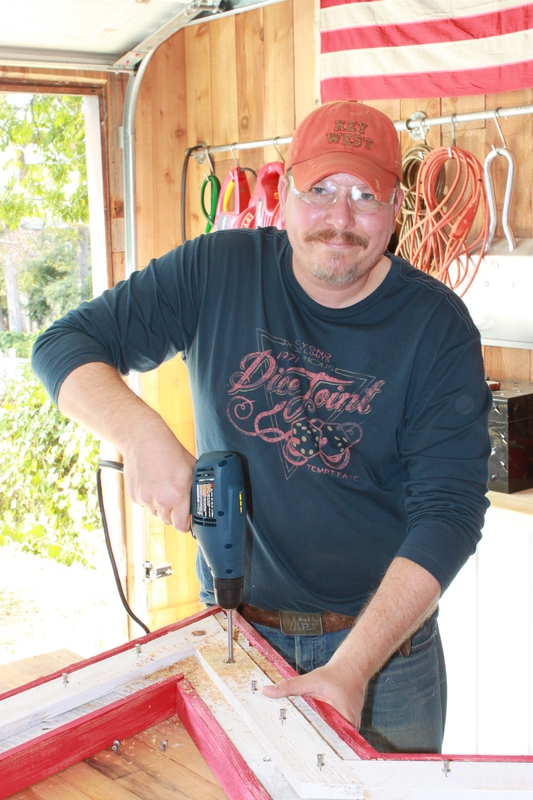 Cordless drills are great for screwing lightweight stuff together, but a good power drill (the kind that plugs in) has all the power that I needed for boring through all that super-tough pallet wood. We have a cheap one, I think it was about 30$. It took a while, and a lot of arm strength, but eventually I was able to make all 42 holes. Good thing we had that work table with locking casters to work on. A nice clean work surface makes all the difference with a big scale project like this. We had a couple of white C7 light cords already. The white will blend in more with the white dry brushed wood. If you can’t find white, they are available at Partylights.com. Before I could slip my sockets into the holes I just drilled, I had to snip the hook off the socket. Just used a pair of wire snips. 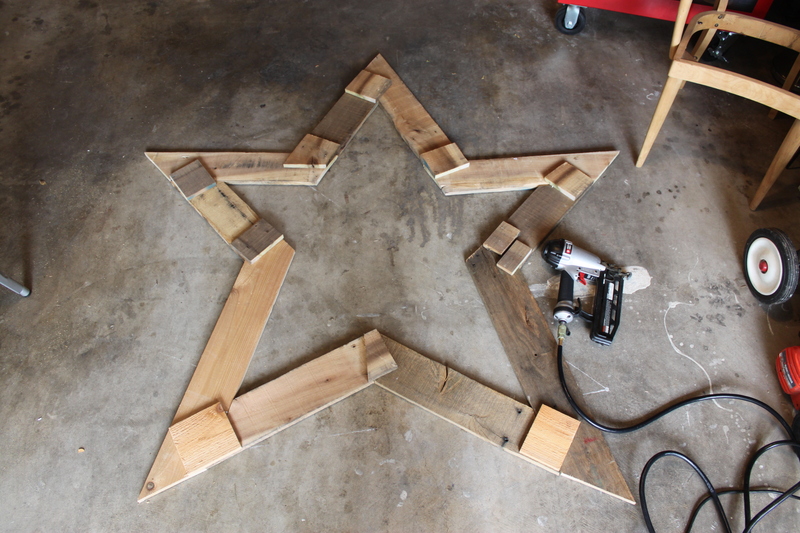 Then I could flip my star over and slip all the light sockets into the holes I just drilled. Pretty simple. 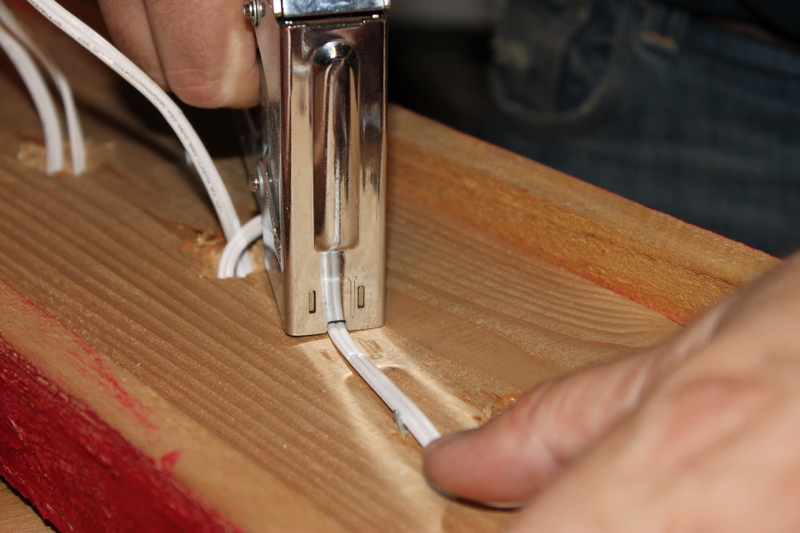 Stapling the cords down can be a little tricky as well. Make sure that the cord is inside the guide on the stapler. I didn’t want to short out my cord before I even got the light bulbs in. OOOh yeah, this is a T-50 stapler. It’s slightly bigger than an office stapler. Buy a “Big Boy” stapler if you plan on doing projects like this. I used 3/8 inch staples. I only had 42 holes and 60 outlets on my light cord. 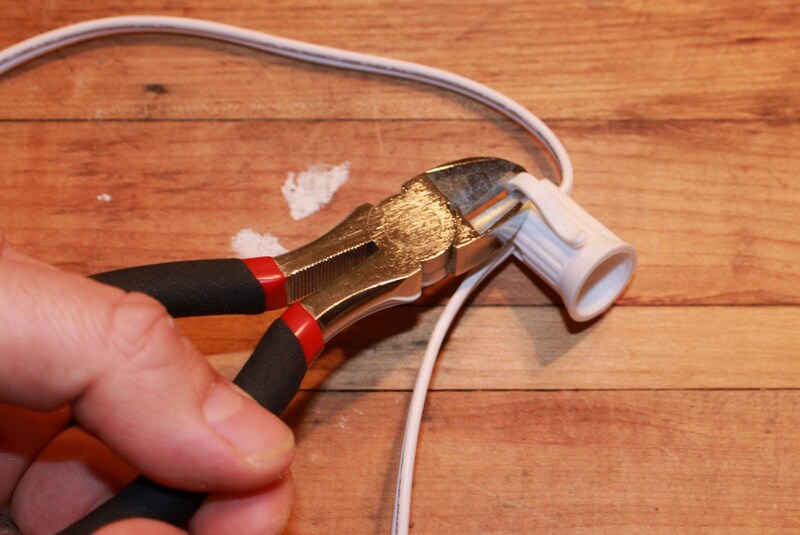 Did you know that you can cut light cords? Well you can. If they are the big C-7 or C-9 cords…dont do it to B sizes lights. The ends of my lights were cut off, and I twisted wire nuts over the exposed ends. 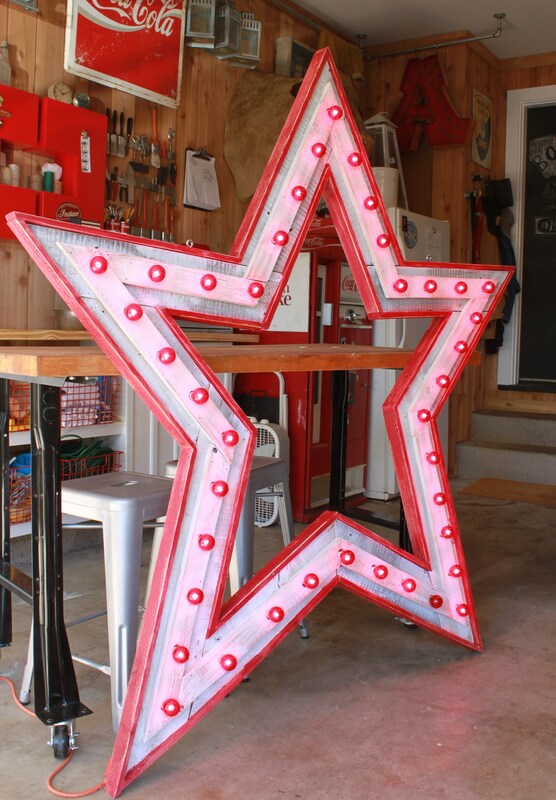 This looks cleaner than just tucking all the extra light cord behind my star. I didn’t work this hard to have it look unprofessional. To keep the wire nuts from ever slipping off, I made them even more secure by wrapping electrical tape over the whole mess. I was almost ready to add bulbs. First I had to scratch the whole thing up just a bit with some heavy grit sandpaper. Really make it look worn and found, not so much “new construction”. Here’s the bulbs I used. 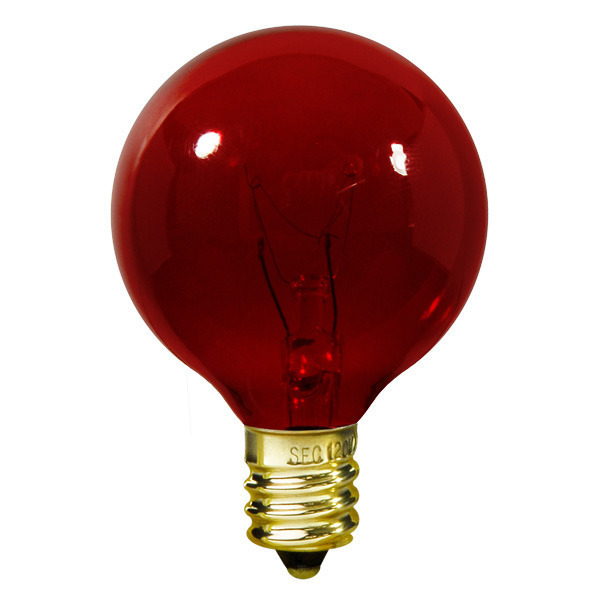 Bulbrite red transparent 10 wat G12, the same bulbs they use on carnival rides. And who doesn’t like a carnival atmosphere? They also come in blue, amber, green, clear and bubble gum pink. You can buy them from 1000Bulbs.com, at about 60 cents each. That sounds pretty cheap, but when you add up all the sockets…it can get a little pricy. 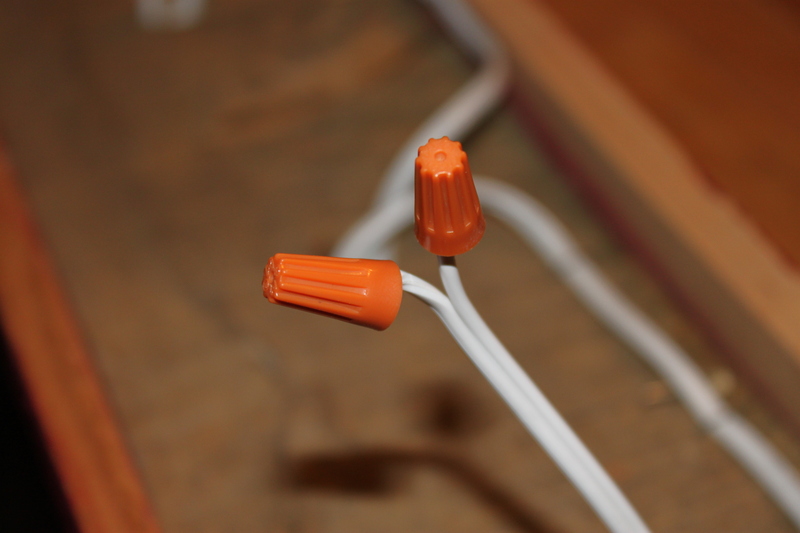 Regular ceramic Christmas light bulbs are only about 25 cents each, and will work just fine. 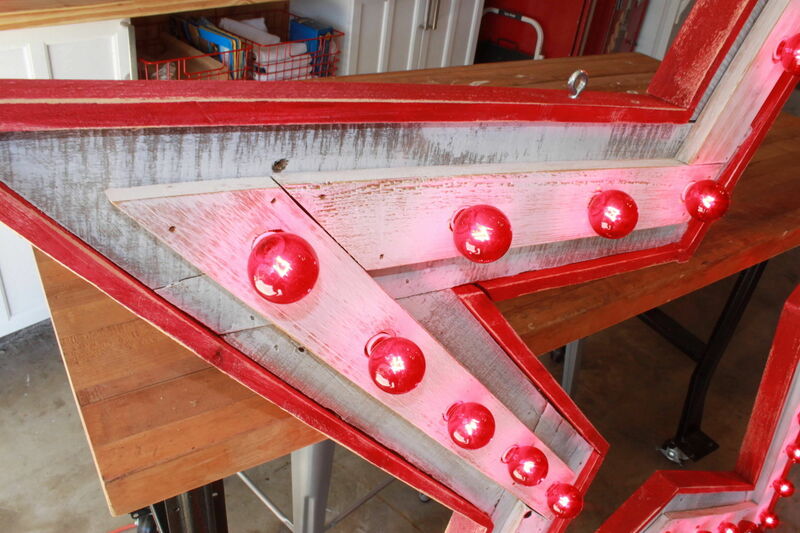 But I just love the “look” of the carnival lights and think they are worth every penny. We used to use them for stringing across the old patio, so we already had a box of them. Now we have to share this baby with the neighborhood. I draw a lot of sketches for projects. Sometimes I forget about them entirely…….and other times, I draw the same projects over and over. This is one of those repetitive ideas I’ve had. I found this sketch on my notepad by the workbench in the garage. 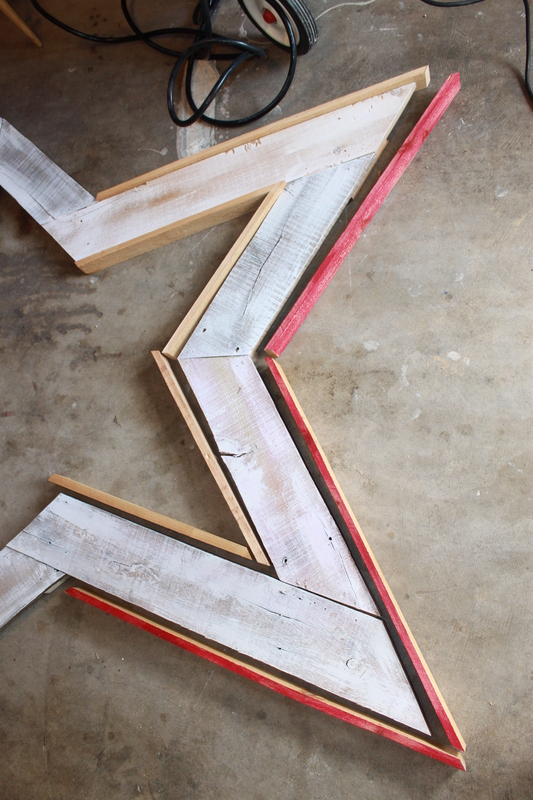 Remember almost a year ago when we started collecting pallet wood to make our headboard wall in the master bedroom? We decided that it was just a little rustic nasty-gross to put in the bedroom. Well, I didn’t get rid of it…….. I know, I know, “Cough-Hoarder-Cough”. 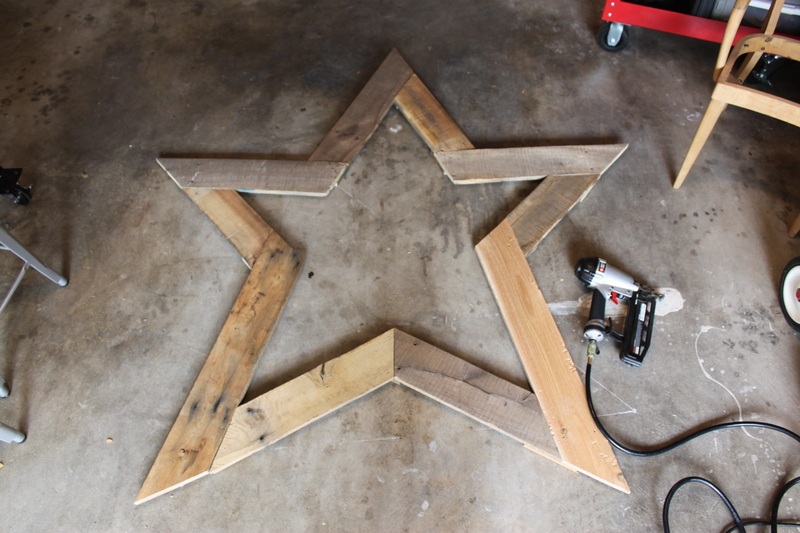 Good thing, Because I thought I’d hack it up to make a big ol’ barn wood (read that – pallet wood) star. 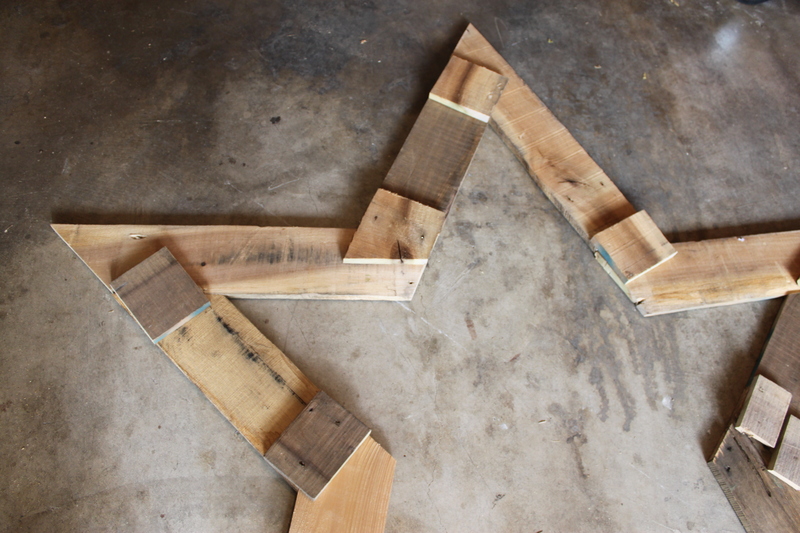 I started by cutting all those pallet pieces into what I believed was 5 perfect 36 degree points. I had to get Jamie’s math skills involved with this one. The 2 of us working together could NOT figure out the process for making a perfect five point star. We Googled. We Sketched. We attempted to make a small 12 inch version……Nothing worked. We gave up and went to bed. Notice how there are several star drawings, a protractor (we made a 9 PM run to H Depot), and a dozen small 36 degree mitered wood pieces. None of it helped. Way Too Complicated……I just can’t do “perfect”. But I might be able to do “folk art”. The very definition of folk art is,” Imperfect art the requires very little natural talent, skill or exerted effort of any kind to accomplish”. 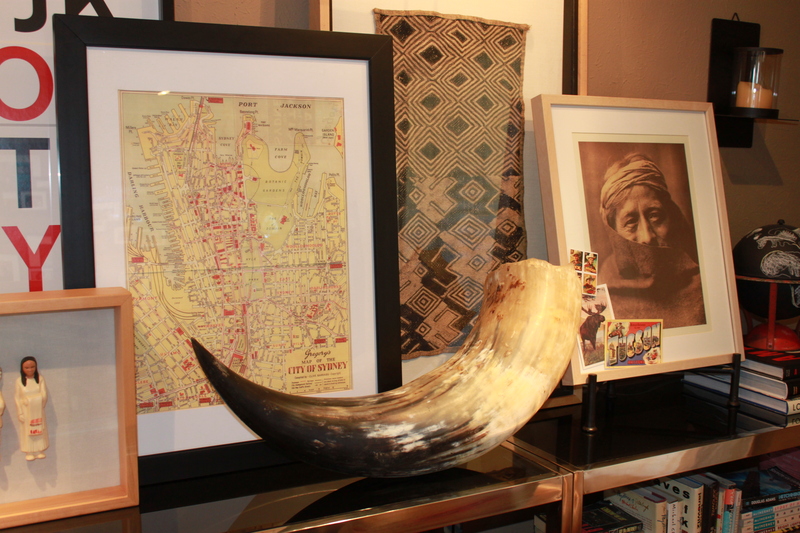 I took a deep breath, and decided to approach the whole project from a “folk art” point of view. 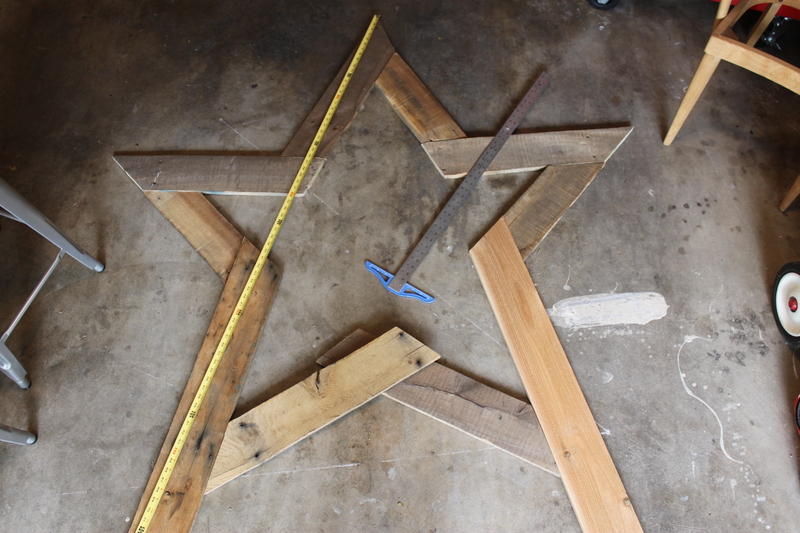 I lay all the cut pallet pieces on the floor, where Jamie had started drawing a Pentagram in chalk as a guide (we both agreed that it looked like we were resorting to calling on the Dark Lord to guide us …..and erased it quickly. I don’t think even “He, who shall not be named” has the power to create a perfect star), and lay out my star-ish shape. It was a pretty good start. 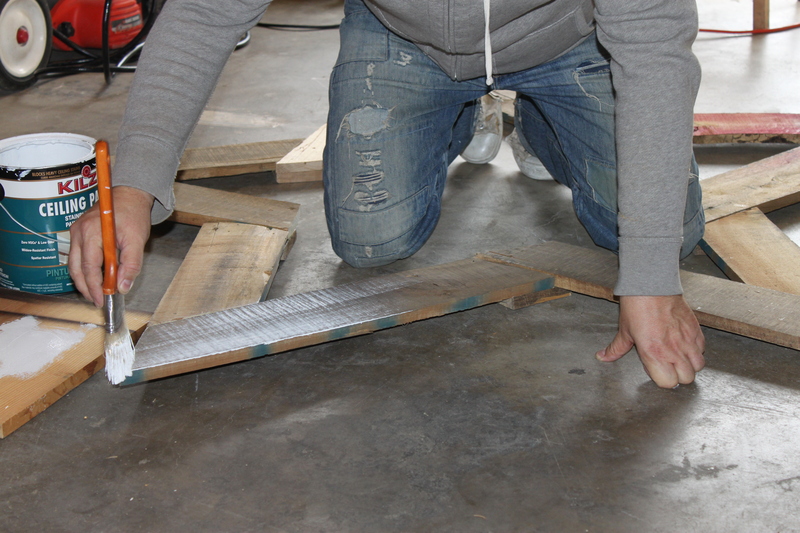 I made the 2 bottom “legs” the same length and met the 2 smaller boards in the exact middle with the same angle. ‘Till everything looked like this. 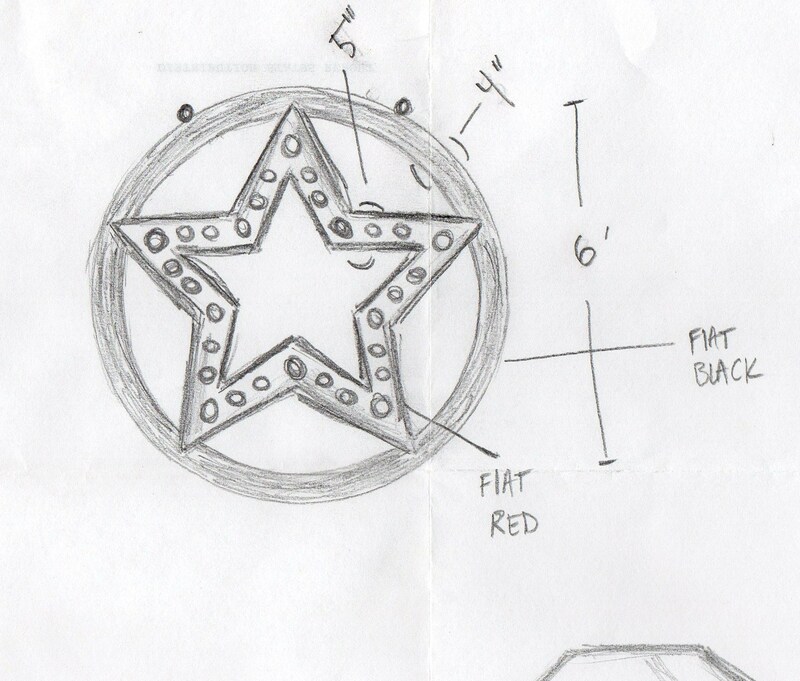 It’s not a perfect star. But it definitely has the look I was going for. 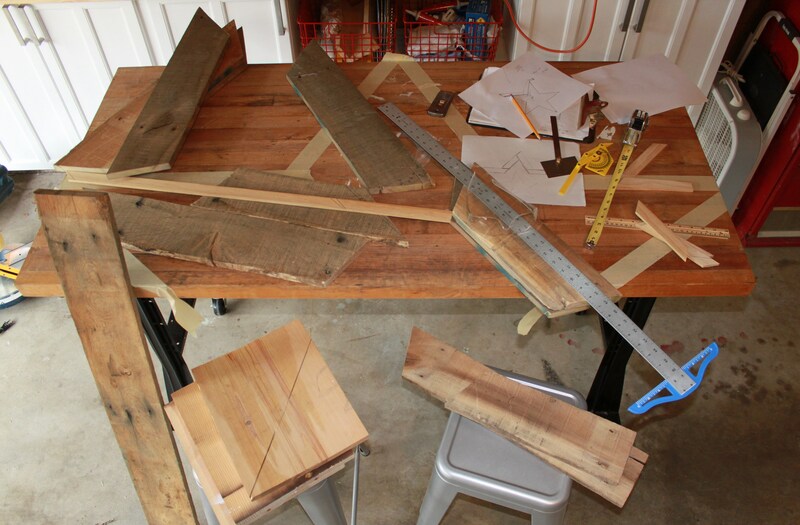 Then I reinforced all the joints with small boards…..I put a scrap under each joint and shot it full of brads. Here’s what it looks like from behind. 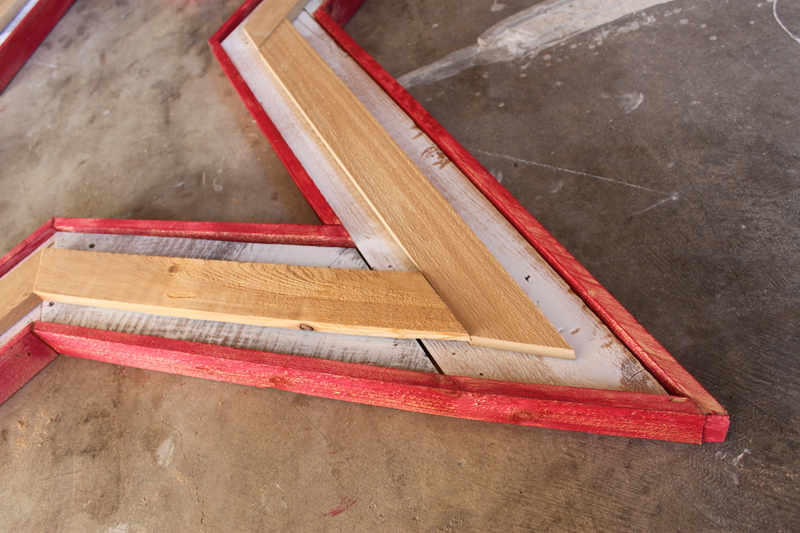 Here’s a closer shot of the joint pieces…just scraps really. 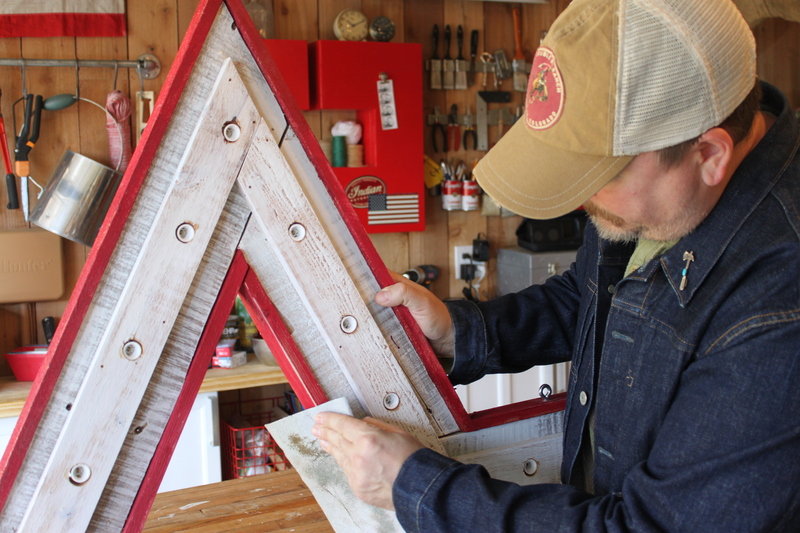 I wanted everything to have a “Vintage Barnwood” look. So I dry brushed over the palate wood with the only flat white paint we had. Ceiling Primer. If you’ve never used a dry brush technique. It’s pretty simple. Just dip the tip of the brush in paint, wipe the excess paint off your brush on a piece of scrap and then lightly drag it over your surface. 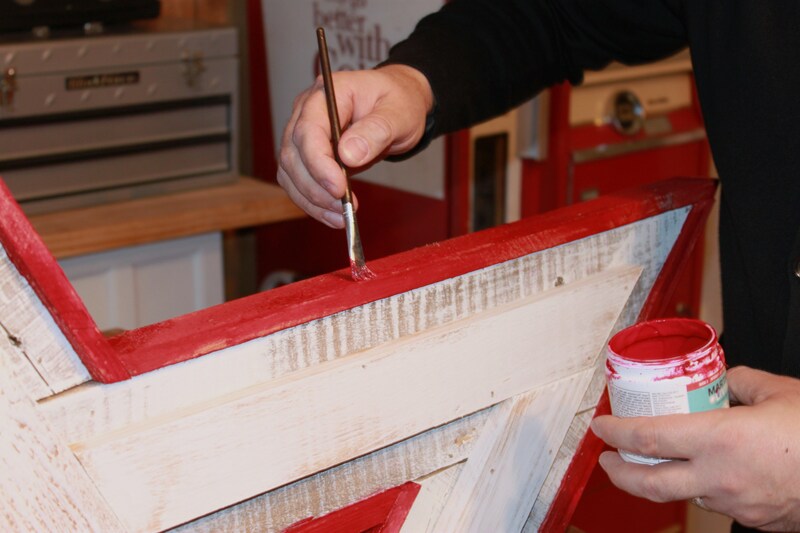 Use way less paint than you think that you need. It’s much better to do a thin layer of paint and keep adding more, than to saturate your surface and make it look painted. I wanted the wood grain to show through. Like old, weathered barn wood. I think I achieved that look. See? Not too white, and not too “woody”? Just what I wanted. My star was extremely flimsy. I had a plan to reinforce it further and hide the weird joint pieces from the sides. 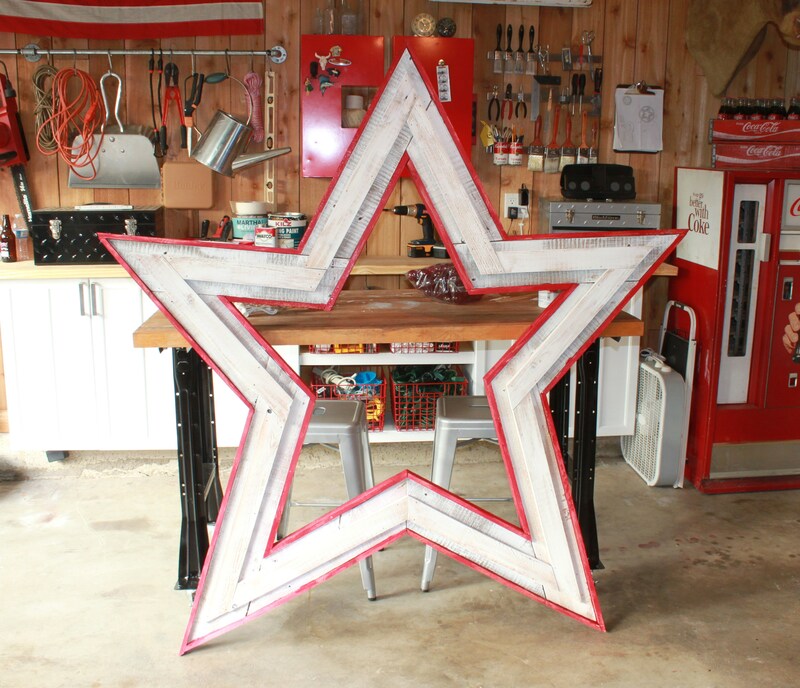 So I trimmed the whole star, inner layer as well as outer, with mitered cedar 1X2 s that I also dry brushed….but, this time with red paint. There are still a lot of cedar scraps in the garage left from when we lined the walls. How could I throw them away? “Every part of the buffalo”. Remember that mantra? I had a small tester of Martha Stewart red from a different project that never saw the light of day. It’s called “BARN”. I think that name was exactly what I was going for with this project. I thought it looked a little “Raspberry” at first, but once it dried….perfection. 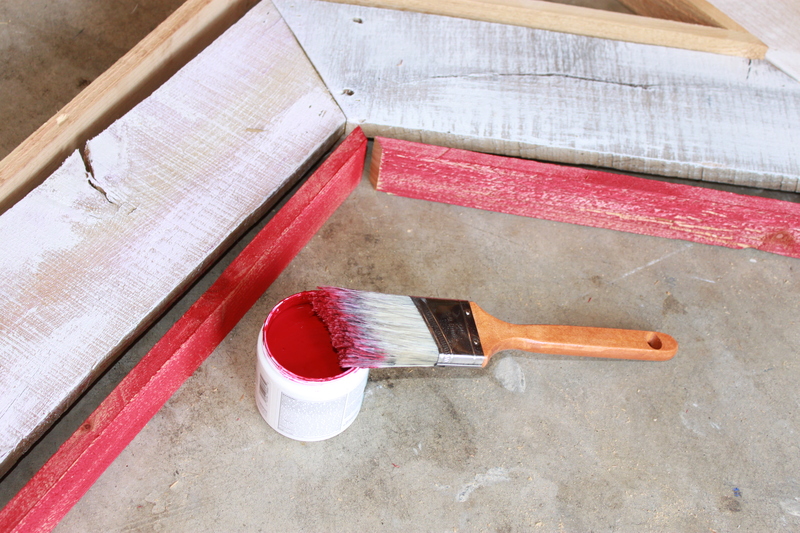 The perfect “Barn Red”, that Martha sure knows how to name her colors. Still a little flimsy. No worries. I was ready for that too. 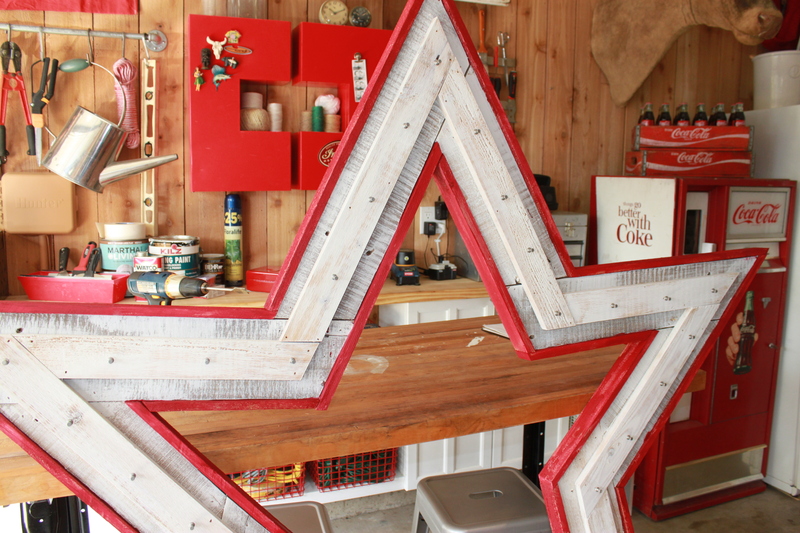 I added a second 2 1/2 inch star trim inside the first star with cedar we had left in the garage. This one was much easier. I didn’t need to calculate any angles. 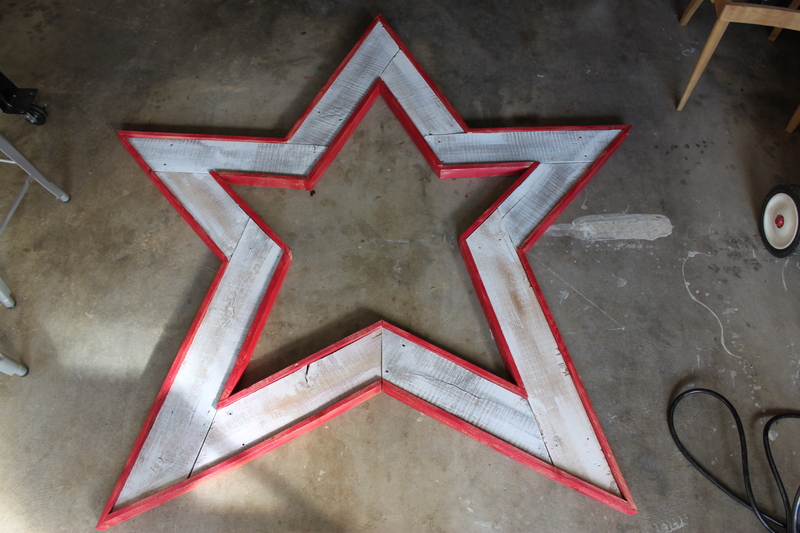 I just followed the lines of the big star for all my angled cuts. I attached it with more brads. I made sure that I only shot the brads into the very edges of the wood, not the middle. I’ll explain why later. My first instinct was to dry brush this red too, but changed my mind when I saw it. (not to ruin any surprises, but y’all will see why in a later post) So white ceiling primer was dry brushed on the inner cedar star as well. 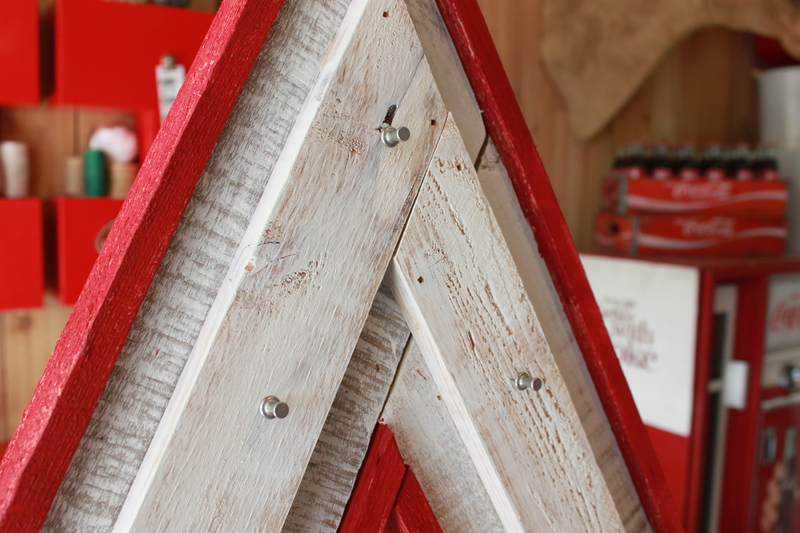 Once I got everything together, I touched up the red, to be a little bit more “Red” and to get into all the crevices that I didn’t see on the first go-round with the red paint. 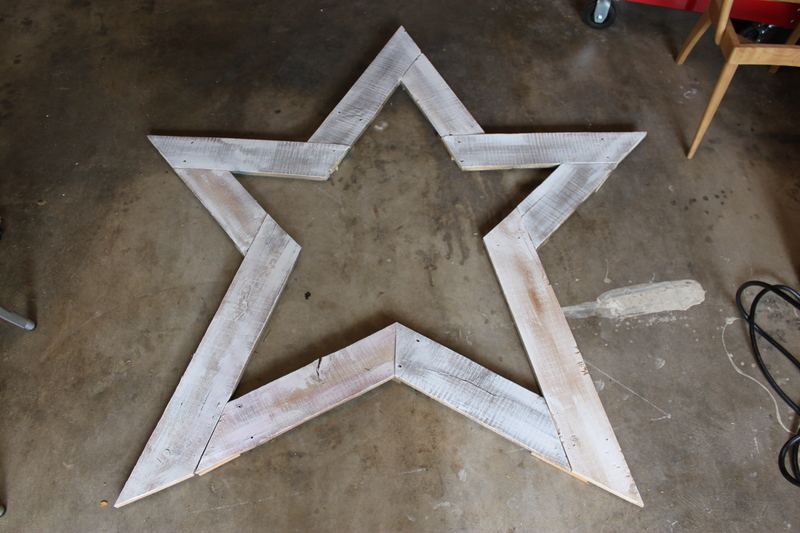 Here’s my finished star. Almost 6 feet tall. Pretty Cool? Right? Everything I used, I already had. So it was practically free. 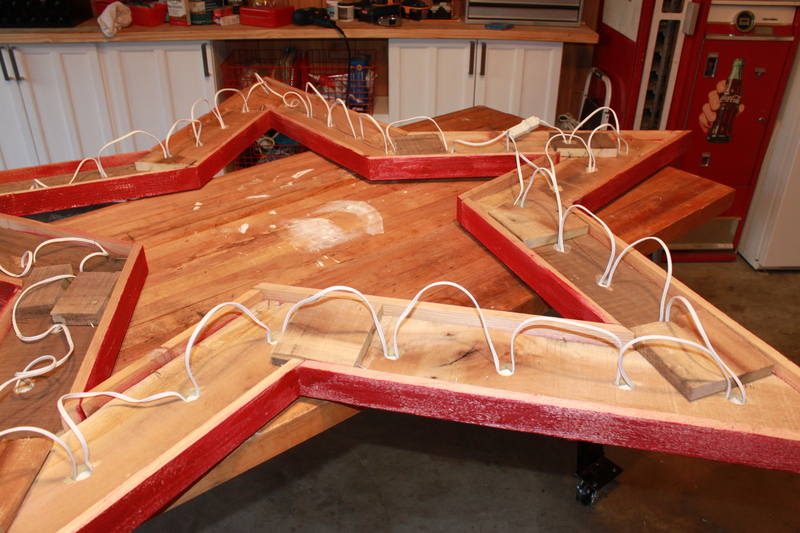 …..and this is only HALF of the project! Just wait ’till y’all see what we do with it. We hope you are spending the day with your loved ones just like we are. Now get off the web….. When we’re right, We Are Right. 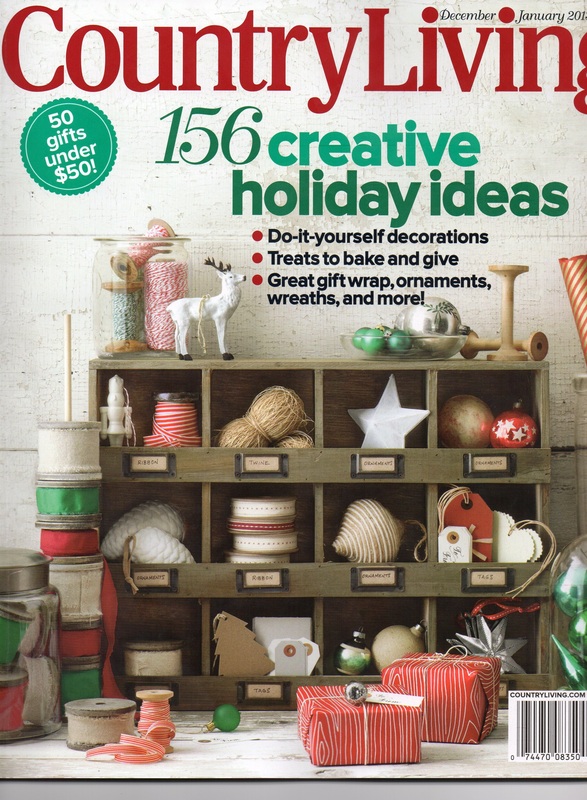 Sifting through the December issue of Country Living …. 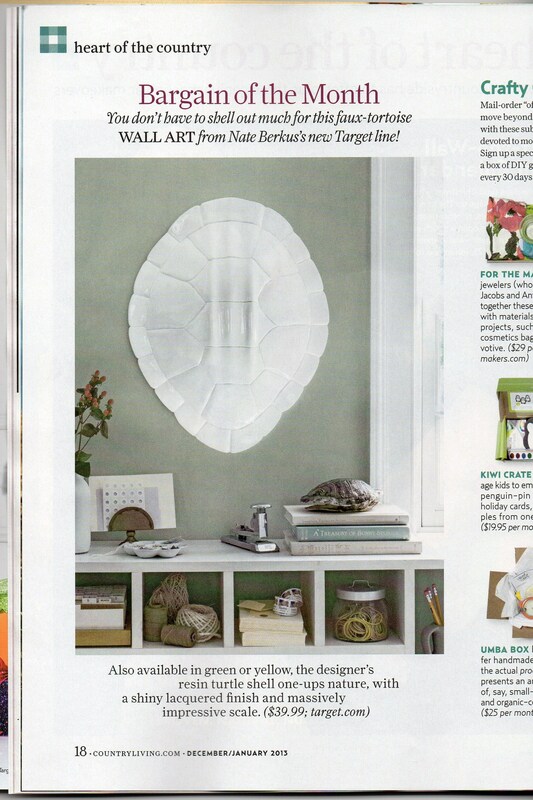 And who would have predicted that the Nate Berkus tortoise-shell would be such a hit? AAhhhhh, We did. That’s who. I think y’all might remember just a few weeks ago when we raced to Target early just to pick up one of these babies. They aren’t available online anymore, but the Target website has a store locater…..and they ARE still in stores. SO what are you waiting for? Go! Get your own while you still can…. We read a lot of different blogs. Seriously, A LOT of BLOGS. There isn’t enough time in the day to read every one daily (with work interfering with a good center portion of each day). So there are only a few that we visit with regular frequency. Young House Love is one of them. John and Sherry Petersick started blogging about the trials and tribulations of home ownership for family and friends to keep up with. Very similar to us actually. Their “No Fear” attitude to home renovating has inspired us on numerous occasions and their site has become a model for what we hope ours will become. A place not just to highlight our own accomplishments, but to inspire others to change their own homes as well. They had no idea that one day their readership would equal about 5 million, let me type that again 5 MILLION, site views a month. We contribute a handful of those. Their blog has seriously turned into a full-time job for each of them. Really. They both left corporate jobs to devote every minute of every day to blogging about their decorating, and renovating, and home-related projects…. And then they got a book deal to share some of those experiences decorating, and renovating, and doing home-related projects…..
Last week in a Houston hotel room, I was cruising my usual blogroll…….and I saw that they were going to be in Dallas. My Dallas. Normally, November is a pretty crappy month for personal agendas. I devote a good chunk of my month installing Holiday decor in my stores, and Jamie is rushing to install clients before the end of the year. It’s a heavy travel month for us. It always will be and we just accept it. But this year, by some twist of fate, we were both free Saturday November 17th….and available to stand in line to meet a couple of personal heroes. 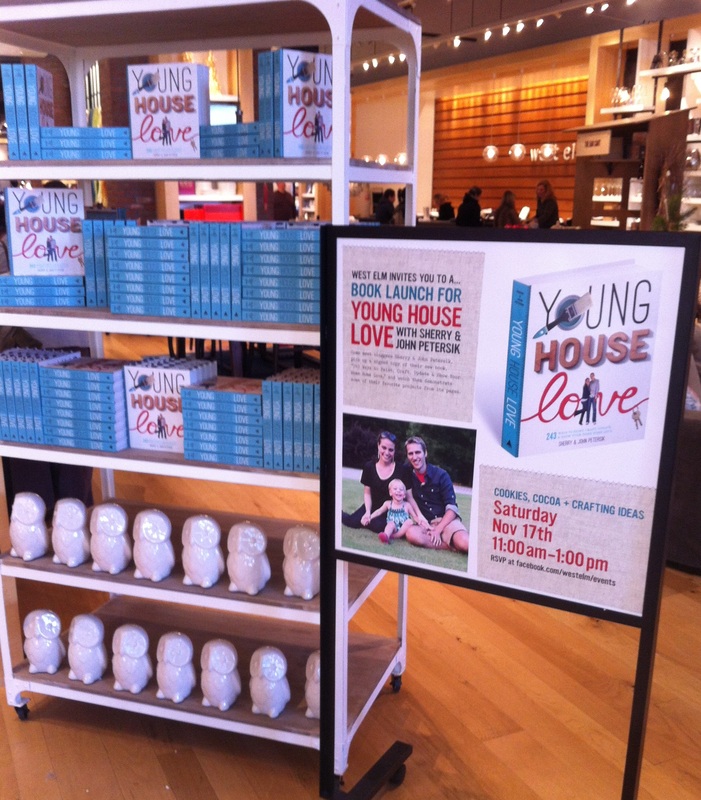 West Elm had racks of book for those, like ourselves, who didn’t bring their own books to be personalized. 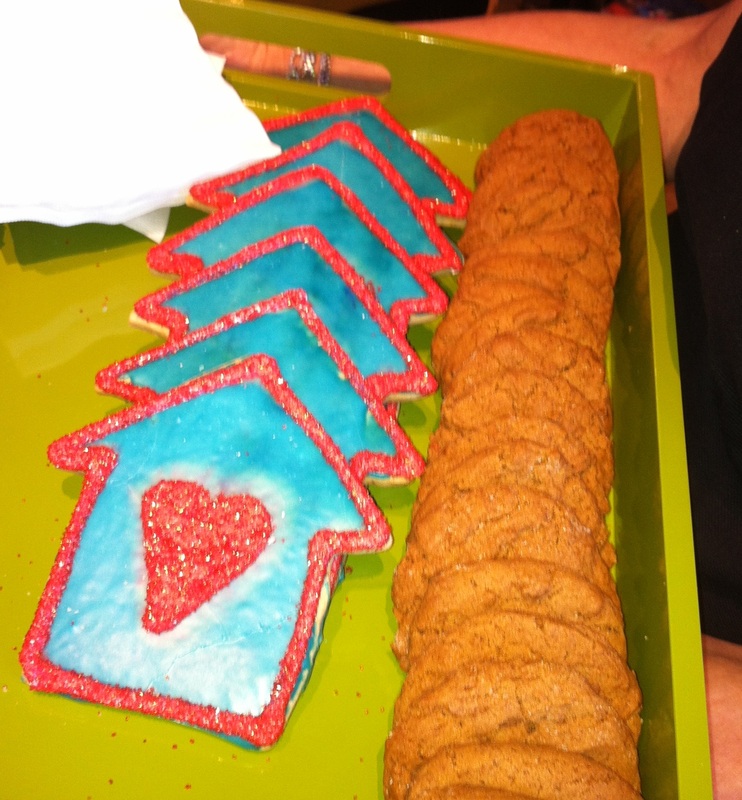 There were even themed snacks…..
A house with a heart, get it? 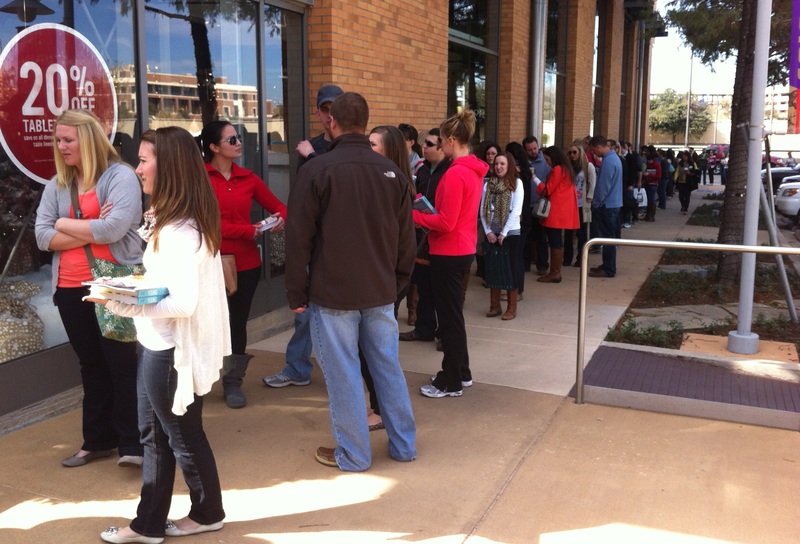 Glad that we got there early, because the line was through the store, out the door, and wound around the parking lot…. I wanted to open the dialogue with how we had bonded with all the great people in line with us, but I think I muttered something about how we had to wait hours outside to see them. Sherry wanted to get a photo of all of us with HER camera, “Just the boys” she said……..and I said something like, “OOH no, that’s OK, you don’t have to do that” Our picture on HER camera??? Did I really just turn that down? One of the store employees took a quick pic with Jamie’s iPhone, and all I wanted to do was remove John’s water from the shot. Nothing creepier than some stranger manhandling your water bottle. We walked away and left our signed book on the table. They are just the sweetest, nicest people. And I’m glad that we got to say “Howdy” while they were in Dallas…..and NOT creep them out by reciting details about their lives. 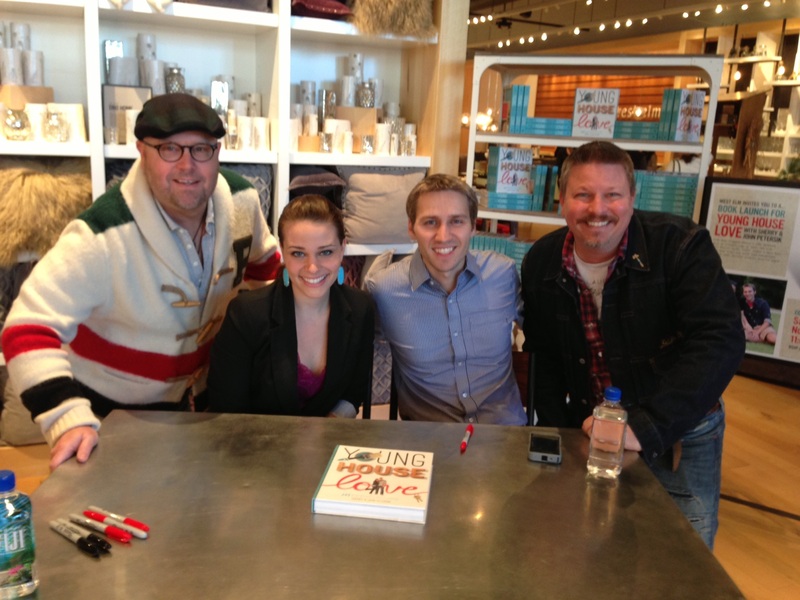 I wanted to ask them to write something like, “Keep on Rockin’ that Cavender Diary”. Dorky, yeah. But I was a little tongue-tied. Jessica, one of the great people we had the pleasure to wait in line with, sent us a handful of pictures she took that day. She’s the cute blond in the center of our odd-ball group of “early-arrivers”. She has a blog about her life and home in McKinney Texas, The Carter’s cup-a-tea, that is as charming as she is. Check it out. 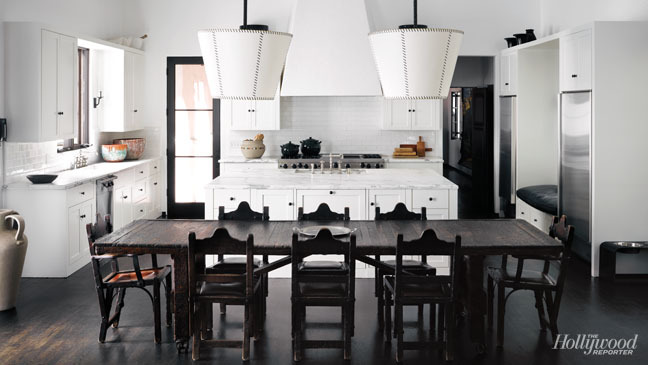 A while back we wrote about Diane Keaton’s amazing California Romantic house. Since Jamie and I couldn’t come up with the nearly 11 Million to buy it, someone else beat us to the punch. 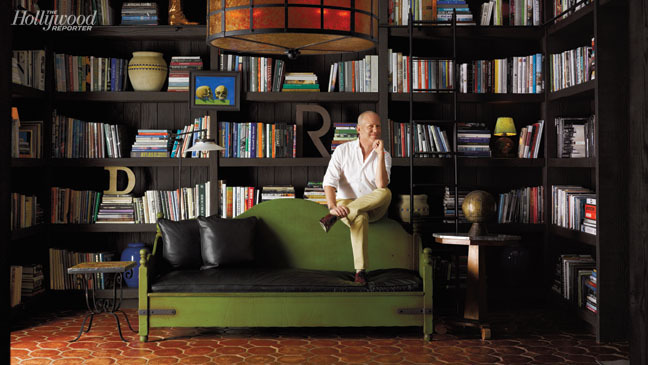 The Tom Ford wearing, Co-Creator of Glee, Ryan Murphy. Ryan did a great job of personalizing the whole space. I think he may have actually made it “warmer”, most certainly more masculine. 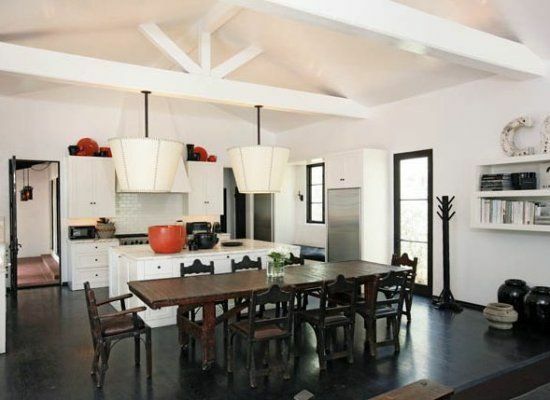 I’m still crazy about those ceiling lights in the kitchen. Here’s a shot with a little more color in the pottery. Although Diane declined Ryan’s offer to buy the house furnished, she allowed him to photograph the furniture so he could replicate the pieces himself. That’s her kitchen table, one of the few pieces she did part with. 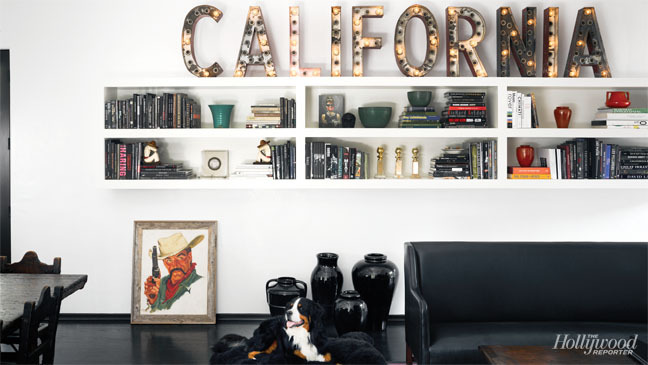 My absolute favorite part of the kitchen now is the CALIFORNIA letters over the built-in floating shelves. I can never have enough old signage. We have “AMERICAN” in the master bedroom, “RATS” in the den, and soon to hang “PHARMACY” in the garage. The bedroom got a slightly more modern look as well…..
Ryan searched like a man obsessed (I’m sure it was an assistant of some sort doing the actual work) to find an almost exact replica of Diane’s green day bed in the library. 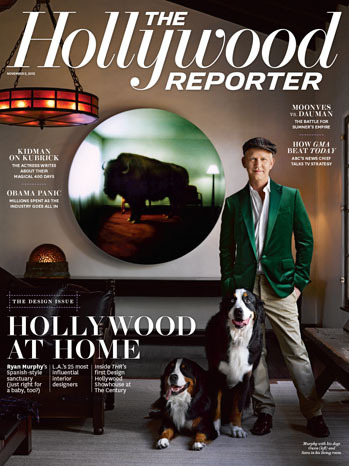 These are just a few of my favorite pictures from the Hollywood Reporter article, you can read more, and see a slide show with more pictures, on the page.